2LT Harold Bascom Durham, Jr.
Harold Bascom 'Pinky' Durham, Jr.
Second Lieutenant Harold Bascom Durham, Jr. (12 October 1942 - 17 October 1967) was a U.S. Army officer and a recipient of the U.S. military's highest award for valor, the Congressional Medal of Honor, for his heroic actions in the Vietnam War. Durham was born on 12 October 1942, at Rocky Mount, NC. 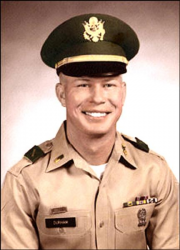 He joined the Army from Atlanta, GA, in 1964, and on 17 October 1967 he was serving as a Second Lieutenant in Battery C, 6th Battalion, 15th Artillery Regiment, 1st Infantry Division. During a firefight on that day in the Republic of Vietnam, Durham repeatedly exposed himself to hostile fire in order to direct artillery bombardment, even after being severely wounded. He was killed during the battle and posthumously awarded the Medal of Honor for his actions. Citation: 2d Lt. Durham, Artillery, distinguished himself by conspicuous gallantry and intrepidity at the cost of his life above and beyond the call of duty while assigned to Battery C. 2d Lt. Durham was serving as a forward observer with Company D, 2d Battalion, 28th Infantry during a battalion reconnaissance-in-force mission. At approximately 1015 hours contact was made with an enemy force concealed in well-camouflaged positions and fortified bunkers. 2d Lt. Durham immediately moved into an exposed position to adjust the supporting artillery fire onto the insurgents. During a brief lull in the battle he administered emergency first aid to the wounded in spite of heavy enemy sniper fire directed toward him. Moments later, as enemy units assaulted friendly positions, he learned that Company A, bearing the brunt of the attack, had lost its forward observer. While he was moving to replace the wounded observer, the enemy detonated a Claymore mine, severely wounding him in the head and impairing his vision. In spite of the intense pain, he continued to direct the supporting artillery fire and to employ his individual weapon in support of the hard pressed infantrymen. As the enemy pressed their attack, 2d Lt. Durham called for supporting fire to be placed almost directly on his position. Twice the insurgents were driven back, leaving many dead and wounded behind. 2d Lt. Durham was then taken to a secondary defensive position. Even in his extremely weakened condition, he continued to call artillery fire onto the enemy. He refused to seek cover and instead positioned himself in a small clearing which offered a better vantage point from which to adjust the fire. Suddenly, he was severely wounded a second time by enemy machine gun fire. As he lay on the ground near death, he saw two Viet Cong approaching, shooting the defenseless wounded men. With his last effort, 2d Lt. Durham shouted a warning to a nearby soldier who immediately killed the insurgents. 2d Lt. Durham died moments later, still grasping the radio handset. 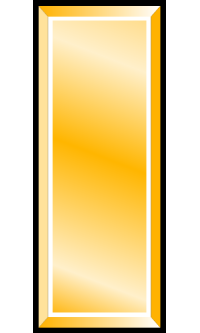 2d Lt. Durham's gallant actions in close combat with an enemy force are in keeping with the highest traditions of the military service and reflect great credit upon himself, his unit, and the U.S. Army. The name of Harold Bascom Durham, Jr. is inscribed on Panel 28E - Line 20. 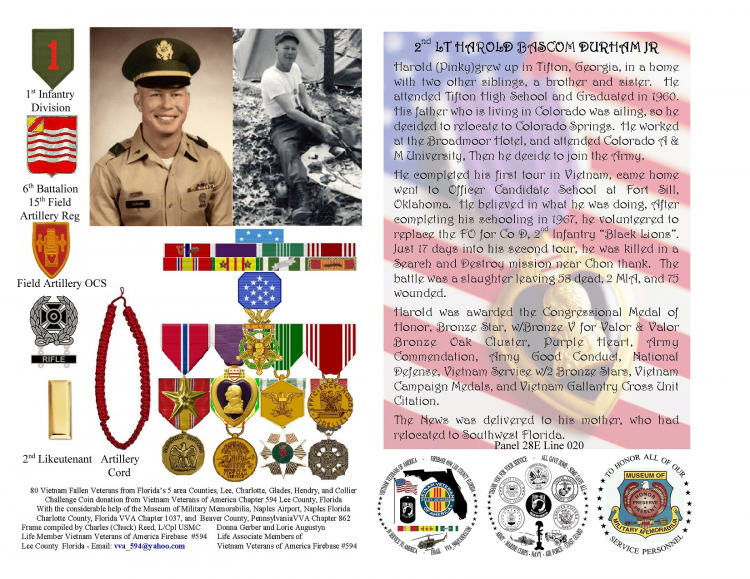 Second Lieutenant Harold Bascom Durham, Jr. was killed in action on 17 October 1967. 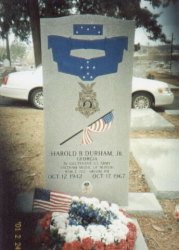 He is buried at Oak Ridge Cemetery in Tifton, GA.
2nd LT HAROLD BASCOM DURHAM JR, Harold (Pinky)grew up in Tifton, Georgia, in a home with two other siblings, a brother and sister. 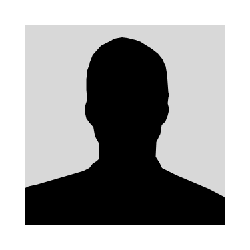 He attended Tifton High School and Graduated in 1960. His father who is living in Colorado was ailing, so he decided to relocate to Colorado Springs. He worked at the Broadmoor Hotel, and attended Colorado A & M University, Then he decide to join the Army. He completed his first tour in Vietnam, came home went to Officer Candidate School at Fort Sill, Oklahoma. He believed in what he was doing, After completing his schooling in 1967, he volunteered to replace the FO for Co D, 2nd Infantry “Black Lions”. Just 17 days into his second tour, he was killed in a Search and Destroy mission near Chon thank. The battle was a slaughter leaving 58 dead, 2 MIA, and 75 wounded. 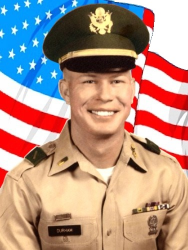 Harold was awarded the Congressional Medal of Honor, Bronze Star, w/Bronze V for Valor & Valor Bronze Oak Cluster, Purple Heart, Army Commendation, Army Good Conduct, National Defense, Vietnam Service w/2 Bronze Stars, Vietnam Campaign Medals, and Vietnam Gallantry Cross Unit Citation. The News was delivered to his mother, who had relocated to Southwest Florida.